She won’t show it, but it’s there. Its very obvious to the touch, but difficult to get a good look. It’s a little ironic that Lawson got his first tooth so fast and despite having many teeth he insists on eating only pureed food until recently when he finally tried bread. on the flip side Gwendolyn has remained toothless well into ten months and she will eat dry cereal, biscuits, rice, bread… anything. It’s bee a long time with no sign of test from her. 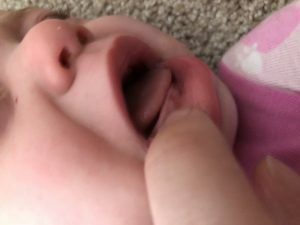 Way back, we thought she was an early teether, but it turned out to be just a cyst. At their nine month appointment, the doctor thought teeth were on the way. But it is only just now that a tooth is beginning to finally break through. This is something that we both have been anxiously awaiting and I am so happy it is finally happening, but I am so not ready for the tears and the screaming that will undoubtedly ensue. We have already given her one dose of Tylenol to ease the pain of teething and it worked really well. Lawson is a terror when he goes through teething pains and he is not prone to crying. Gwendolyn cries a lot, so I don’t know what we are in for. Still, I’m excited. 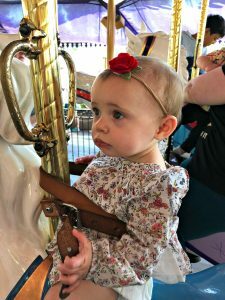 Gwendolyn on King Arthur’s Carousel at Disneyland. Both babies are getting accustomed to more normal diets an are less reliant on milk of formula. 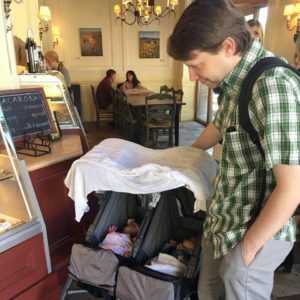 They have started eating bread and rice and have even had a toddler meal on our recent Disneyland adventure. Gwendolyn especially has taken to sipping water with a straw, but Lawson is quite good at it too. It seems they skipped right over using the traditional sip cup and strongly favor this new drinking method. Who knows how long the teething process will continue to go? We have regularly brushed, even when there were only gums. Lawson might have some slight teeth problems, they way they are growing in, but we can’t be sure yet.